1. I really have to go to Japan soon. 2. The number of humans doing stupid things is exponentially proportional to human progress. Please allow me to explain. Never in the history of humankind we had better education systems than now. We never had better science. We never had access to limitless information. We never had more technological resources at our disposal to do truly incredible things. 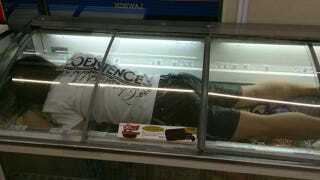 And yet—look at this idiot getting into a freezer just to upload a photo to Twitter. Or all the imbeciles who post videos and pictures of them doing the most offensively asinine stuff in Instagram or Facebook or YouTube. The amount of imbeciles doing dumb things seems to be increasing every single day, in alarming numbers. And just when you think something can't be more stupid, someone comes and proves you wrong. While you can argue that the proportion of imbeciles has been constant through the ages and technology is just putting them under the spotlight, I believe that this is not the case. Instead, progress has brought humans a lot of free time. And instead of using it to do amazing things, we use it to do really stupid things and then facebooking and tweeting and instagramming them. And then write comments about them and like them or downvote them, which is even a more stupid waste of time. In the past we didn't have time for any of this—surviving wars, finding food or escaping from predators used up most of our very limited time on Earth. If you were stupid or wasted time, you would die. But now, people can survive and thrive shimmering in their own stupid juice. Yet, we should be optimistic! Despite our common idiocy, Humanity will prevail and succeed. One day, we will master interstellar travel, understand all the secrets of the Cosmos, and live in worlds distributed across the Universe thanks to the effort of many smart and hard working people. And then, when we have our replicators and teleporters and warp drives, then we will have all the time in the world to facebook and tweet and instagram all the stupid crap we want through the sub-space internet, till the end of time.